Obama Slows Afghan Withdrawal Again, Keeping 8,400 Troops Through His Term : The Two-Way At one point, President Obama had plans to essentially end the longest war in U.S. history. Over the past two years, Obama has changed those plans. Flanked by his secretary of defense and the chairman of the Joint Chiefs of Staff, President Obama announced that he was once again slowing the withdrawal of U.S. troops in Afghanistan. By the time President Obama leaves office, 8,400 American troops will remain in the country. Obama said this was "the right thing to do." "It is in our national security interest ... that we give our Afghan partners the very best opportunity to succeed," Obama said. 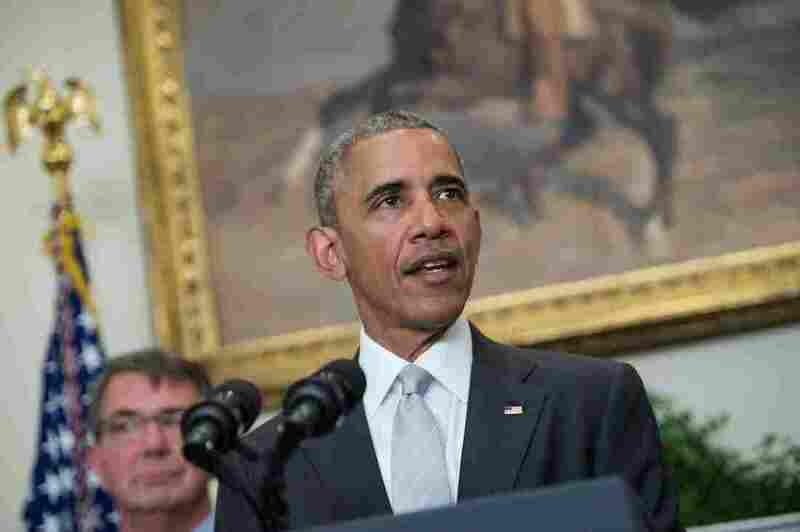 The mission of the troops will not change, Obama said. They will not be engaged in combat; instead, they are in the country to train, advise and support Afghan troops in counterterrorism operations against al-Qaida. It is worth noting that last month, Obama also expanded the situations in which the U.S. military can engage with the Taliban. It was just two years ago that Obama stood in the White House Rose Garden and announced that by the time he left office, American troops would only be assigned to the U.S. Embassy in Kabul. It meant a definitive end to America's longest-running war. In October of 2015, Obama announced he would slow those plans, saying his successor would inherit 5,500 troops in Afghanistan. Today, Obama said that the security situation in Afghanistan "remains precarious," and he had revised those plans in consultation with his Cabinet, the Pentagon, Congress and the Afghan government. "Afghanistan is not a perfect place," Obama said, adding that it was one of the poorest countries in the world. "It is going to continue to take time for them to build up the military capacity that we sometimes take for granted. ... Given the enormous challenges they face, the Afghan people will need the support of the world, led by the United States, for many years to come."